http://www.JewishWorldReview.com | As the public debt of the United States approaches the $14.3 trillion limit currently allowed by law, Congress is being pressed by the Obama administration to change the law and raise the limit. For months, Treasury Secretary Timothy Geithner has warned that failing to lift the debt ceiling would have "unthinkable" consequences. But many lawmakers are insisting that they will block the federal government from borrowing more money unless budget cuts and spending reforms are part of the deal. Geithner told CBS last week that the results of failing to raise the debt ceiling would "shake the basic foundation of the entire global financial system." Other voices are singing from the same hymnal. "If Congress fails to raise the federal debt limit, the government will default, which all parties agree would have catastrophic effects on the economy," writes Joshua Green, a senior editor at The Atlantic. The Associated Press recently reported that if "borrowing slams up against the current debt limit ceiling of $14.3 trillion and Congress fails to raise it," the resulting "damage would ripple across the entire economy, eventually affecting nearly every American." When Democratic Senator Mark Warner of Virginia asked at a hearing in April what would happen "if we were to default and not raise that debt ceiling," Federal Reserve Chairman Ben Bernanke replied ominously: "It would be an extremely dangerous and very likely recovery-ending event." Sounds scary. If the US government were to default on its debt, the fallout would indeed be calamitous. The full faith and credit of the United States would be undermined, foreign investors (who hold almost half of outstanding Treasury debt) would be spooked, interest rates could shoot up, and a stock market crash could set off a new financial panic. But as anyone with a credit card or home-equity line of credit knows, reaching a borrowing limit and defaulting on debt are two very different things. Maxing out your credit card doesn't mean you're broke, it only means you can't borrow more money. So until you get a credit-limit increase or pay down some principal on your debt, you'll have to live on your take-home pay. But as long as you continue to make timely interest payments, your creditworthiness remains intact. By the same token, reaching the federal debt limit will not plunge the federal government into default. "Hitting the ceiling means that we can spend only what we collect in taxes," wrote former Assistant Treasury Secretary Emil Henry in The Wall Street Journal last week. Federal tax revenue for 2011 is expected to be $2.2 trillion, while net interest on the debt will cost $225 billion. With so much money coming in, the United States will have no trouble paying its creditors. Of course $2.2 trillion cannot fund everything in a bloated $3.7 trillion federal budget. That's why the administration wants to keep borrowing money -- but it can't do unless Congress lifts the debt ceiling. The only alternative would be to cut spending, which is exactly why the budget hawks have chosen this moment to draw a line in the sand. 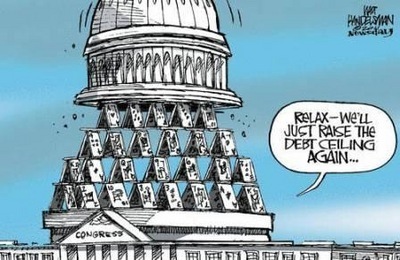 They know that the pressure for spending cuts will dissipate the moment the debt ceiling is hiked. There's no doubt which alternative -- more debt or less spending -- voters favor. Despite all the scaremongering, large majorities consistently say they are against boosting the debt ceiling. A poll for The Hill in February found just 27 percent of likely voters in favor of an increase, while 62 percent (including 64 percent of independents) opposed it. According to the latest NBC/Wall Street Journal poll, only 16 percent of Americans want the limit raised. After last November's GOP landslide, Democrats know better than to ignore the intense public desire to curb government spending and debt. At least four Democratic senators, The Washington Post reports, are now threatening to buck the White House and join Republicans in freezing the debt ceiling and insisting on deficit cuts before they'll consent to lift the country's borrowing limit. Here's hoping voters keep the heat on and their heels dug in. For only fear will bring Washington's insane spending binge to an end. For committed fiscal conservatives, like many of the Tea Party freshmen elected last year, that means fear of the strangled growth, crushing taxation, and irrecoverable loss of wealth and opportunity to which runaway federal spending and debt will sentence future generations of Americans. For the rest of Capitol Hill, it means fear of being thrown out of office by alarmed and infuriated voters, who think $14.3 trillion is about as high as a debt ceiling ought to go.